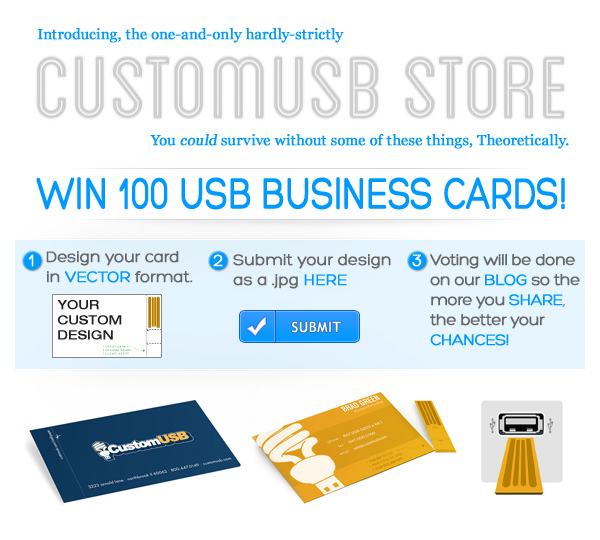 We are giving away 100 of our USB Business Cards! Our USB Business Cards are all about making a statement! Without changing the looks of the average, everyday, well-designed business card, we added a tear-off USB webkey that plugs directly into a computer and launches your website. Made from multiple layers of paper laminated together with a tiny silicon chip in the middle, this product is only about 0.02 inches thick and environmentally friendly. Download the template, and let your creative juices start flowing. After you have your design all ready, email a .jpg of the design to contests@customusb.com with USB Business Card Contest as the subject. Then we are going to post all of the designs here, and let everyone vote for their favorite design! So get the word out! Share this post so all of your friends, family, random strangers, and everyone else can find it to vote for you! ALL ENTRIES MUST BE SUBMITTED BY 11:59 PM AUGUST 2, 2013! We will leave the voting open until 12:00 pm the next Friday, August 9, 2013. At that time the design with the most votes will be the winner! We will post the winner here and contact them via email. The winner has one week after they are contacted to claim their prize or it will be awarded to the person with the next highest number of votes. We reserve the right to not post any designs that contain any offensive material, or material that is not original artwork.